Tumors of the distal femur and diaphysis with proximal metaphyseal extension into the femur present a challenge for limb salvage. The conventional treatment consists of limb salvage with total femur replacement. This case study aims to present preliminary results and experience with short-stem reconstruction, focusing on the mechanical stability of the procedure. Sixteen short stems were implanted in 15 patients. The patients’ mean age was 33,3 years (range 11–73). In 10 patients, the stem was used for distal femur reconstruction, in one patient for diaphyseal reconstruction, and in four for a stump lengthening procedure. All of the patients had a primary sarcoma in their history. The mean follow-up period was 37 months (range 5–95 months). The clinical and functional follow-up data were analyzed. Ten patients (67%) were still alive at the time of evaluation. Three complications associated with the stem were noted. In one case, there was aseptic loosening after 58 months; in another, aseptic loosening occurred because the diameter of the stem had initially been too small; and in one case, there was breakage of the fixation screw, without any clinical symptoms. The average Musculoskeletal Tumor Society score for all patients was 23 (range 9–28). The mean result for the distal femur replacement was 24 (range 22–28). None of the surviving patients with distal femur replacements needed any crutches or had a Trendelenburg limp. Both living patients who underwent a stump lengthening procedure were able to walk with an exoprosthesis. The short stem is a good solution that can prevent or delay proximal femur resection in patients with tumors extending into the proximal metaphyseal femur. Additional risks of proximal femur resection, such as dislocation, opening of another oncological compartment, Trendelenburg limp, and chondrolysis can be avoided. Tumors of the distal femur and diaphysis with proximal metaphyseal extension into the femur present a challenge for limb salvage. The conventional treatment consists of limb salvage with total femur replacement [1–6]. The disadvantage of total femur resection is that the hip joint has to be resected. This leads to disruption of all the muscles in the proximal femur and leads to a poorer functional outcome, including Trendelenburg limp, in comparison with distal femur replacement [1, 7, 8]. 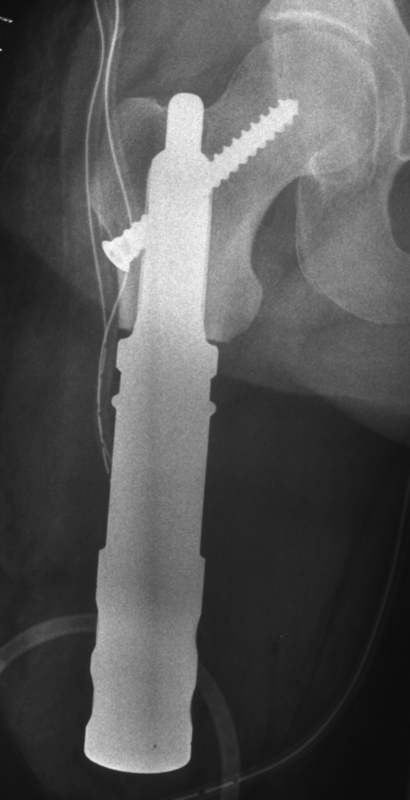 In addition to the problems resulting from distal femur resection, a risk of luxation of the hip is also present [4, 8].To delay or avoid resection of the hip joint in patients with an ultrashort proximal femur shaft, we use a short stem called the “Buxtehude stem” (Implantcast Ltd., Buxtehude, Germany). We use this stem in cases of distal femur resection and for diaphyseal implants when there is an ultrashort proximal femur shaft. We also use it for the stump lengthening procedure. In our clinic the indication for this stem is a proximal femur shaft with 110 mm or less in young patients. Another indication is a bad bone stock in case of revision. In one special case we used a stem length of 130 mm (Figures 1). Aseptic loosening of the cemented stem in patient no. 5. The aim of this case study is to present preliminary results and experience with this short stem, focusing on the mechanical stability of the procedure. The “Buxtehude stem” is custom made and has to be ordered at least 4 weeks before the planned operation. There must be at least 40 mm of the femur left. The stem fixation technique is based on three principles: Firstly, the rib profile of the stem is for fixation in spongy bone. Secondly, the top (diameter 10 mm/length 10 mm) is fixed in the fossa piriformis, therefore the stem length should be at least 5 mm longer than the remaining femur. Thirdly, screw fixation in the femoral neck avoids rotation and enhances primary rotation stability. In the past we used a simple 6,5 mm spongiosa screw for locking. After breakage of the screw in patient No 2 we changed to a 8 mm locking screw (Implantcast ltd., Buxtehude). After this methological change no further problems occurred. A coating with hydroxylapatid is possible, but it takes at least 2 weeks longer to produce this stem. Especially in tumour cases the timing with chemotherapy is necessary. Therefore we abandoned of coating in the past. We had an ethics approval of the local ethic committee of the University of Münster (2014-040-f-N). Every patient or parents of children were informed about the study and agreed to publish their data. A consent statement was signed.A total of 16 short stems were implanted in 15 patients between 2003 and 2012. The patients’ mean age was 33,3 years (range 11–73 years). There were six female and 9 male patients. The stem was used for distal femur reconstruction in 10 patients, for diaphyseal reconstruction in one, and for a stump lengthening procedure in four (Figures 2, 3 and 4). For planning the stem a x-ray with a measuring guide on the bone level was performed. The mean follow-up period was 37 months (range 5–95 months). Patient no. 8. Distal femur replacement with short stem and polished tibia stem. Patient no. 11. Diaphyseal reconstruction. Patient no. 15. Stump lengthening procedure. All of the patients had a primary sarcoma in their history. The indication for using the short stem was a primary tumor in seven patients, aseptic loosening of a distal femur replacement in five, and local recurrence or intralesional resection in four (Table 1). Stump lengthening procedures were performed in the four patients with local recurrence or intralesional resection (Table 2). The Enneking stage at the time of surgery was IIb in nine patients and IIIb in six (Table 1). AWD, alive with disease; CDF, clinically disease-free; DFR, distal femur replacement; DOD, died of disease; ICS, intercalary spacer; MSTS, Musculoskeletal Tumor Society (score); SLP, stump lengthening procedure. For the clinical follow-up, radiographs from the regular follow-up were analyzed and the patients’ general practitioners were contacted for further information regarding the stage of disease, or in case of death its cause and date. The surviving patients were contacted to obtain information from a questionnaire assessing current symptoms, occupation, and functional evaluation. Functional evaluation was carried out in nine patients using the Musculoskeletal Tumor Society (MSTS) score . Five patients had died of disease and one patient did not want to response to the questionnaire. At the time of the evaluation, ten patients (67%) were still alive. Five patients with lung metastases had died. None of the patients developed any local recurrences after resection of the primary sarcoma. The short stem was used for distal femur replacement in 10 cases, in one case for diaphyseal reconstruction, and in four cases for a stump lengthening procedure (Table 2). The mean stem length was 77 mm (range 45–130 mm) and the mean diameter of the stem was 21 mm (range 18–25 mm). The uncemented stem was fixed into the femoral neck with a screw in all cases. Three complications associated with the stem were observed, as well as four complications independent of the fixation technique (Table 2). 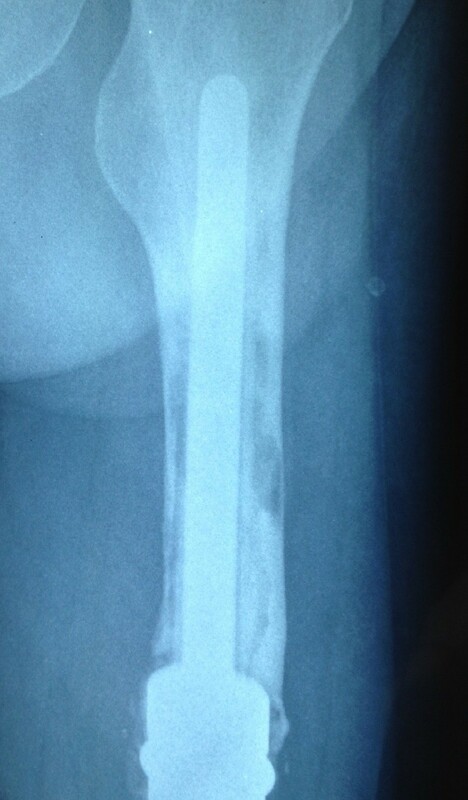 A screw fracture occurred in patient no. 2, with no therapeutic consequences. The patient also had an osteoporotic tibial fracture. He had already had a lung metastasis at the time of primary surgery, and died 48 months after implantation of the stem.Patient no. 5 had aseptic loosening after 58 months and needed to be switched to a total femur replacement (Figures 5). The patient had not had any problems before the aseptic loosening. Patient no. 5: Aseptic loosening of the short stem in case of revision surgery. Early aseptic loosening occurred after 14 months in patient no. 8. Retrospectively, the reason was found to be that a too small stem had been implanted during the initial operation. After revision with a thicker stem, the patient became free of pain and had a good functional result after 22 months. Due to the small number of patients and the different indications for implantation of the stem, the results are limited. It was possible to evaluate the MSTS score in six patients with distal femur replacement, in one with diaphyseal reconstruction, and in two who underwent stump lengthening procedures. The average MSTS score for all patients was 23 (range 9–28). Patient no. 15, with a stump lengthening procedure, had the poorest result. The mean result for distal femur replacement was 24 (range 22–28). None of the surviving patients with distal femur replacement needed crutches or had a Trendelenburg limp. Both living patients who had undergone a stump lengthening procedure were able to walk with an exoprosthesis, and one of them still intermittently needed crutches. Both patients who died had an interim exoprosthesis. They were in bad general condition and not able to walk, because of the oncological progression with lung metastasis. Sarcomas often occur in young patients, as in the present study. Limb salvage is nowadays possible in most cases . Because of the patients’ young age, it is necessary to use an anticipatory prosthetic system. Due to the good oncological survival rates, revision surgery of the prostheses is unavoidable [10, 11]. Distal and diaphyseal tumors with a long proximal femoral extension are often an indication for total femur replacement [1–6]. The complication rates with total femur replacement are high [1, 2, 5, 8], and the functional outcome is poorer than with distal femur replacement [8, 12]. The patients often need crutches or other aids to walk . A specific problem with total femur replacement is dislocation, which occurs in up to 12% of cases [1, 2, 5, 8] and Trendelenburg limping [8, 12]. We have increasingly used a bipolar head or tripolar cup, which may help to reduce this high dislocation rate. Furthermore, when a bipolar head is used painfull chondrolysis can occure as a long term problem . Preserving the hip joint can avoid all these problems. In the present study the surviving patients with distal femur replacement had no need of crutches and no risk of dislocation. From the oncological point of view, proximal femur resection leads to a further problem, as an additional compartment is opened. If there is an intralesional resection or local recurrence, or if infection occurs, the hip joint may be contaminated. To ensure wide margins in case of local recurrence, a hemipelvectomy may be necessary. There were no cases of local recurrence in the present study, but local recurrence rates of up to 10% have been reported in patients with total femur replacement [2, 3]. Another cementless short stem solution with encouraging results is the Compress® implant (Fa. Biomet, Warsaw, USA). The early aseptic loosening rate varies from 3,8% up to 14% [13–17], but the results are limited by population size, heterogenic population and follow- up duration. The advantage of this system is that the compressive osteointegration avoids stress-shielding and save bone-stock. The standard intramedullary implant is 80 mm and was used in most of the studies [13–17]. Indeed an ultrashort reconstruction with 46 mm is possible. However, in the existing studies it is not mentioned how often this short reconstruction is used. Furthermore there is no example where a Compress® implant was used in case of an ultrashort proximal femur [13–17]. Cannon et al. used a cemented approach for fixation of short stems . They used a 90° cross-pin fixation for diaphyseal segments and a 135° cross-pin fixation for short proximal femoral segments. All these implants were custom made. In 14 cases a fixation with a 135° in the proximal femur was done. A loosening was reported in one case. In a meta-analysis the overall aseptic loosening rate of a distal femur replacement is 6,8% . The loosening rate of the standard MUTARS distal femur replacement with a cementless hydroxyl apatite coated stem and hexagonal shaft preparation is 7,7% . In our small case series we have a loosening rate of 12,5%. We think that one reason for this is the learning curve with the implant. Another reason is the short distance of anchoring the stem with sometimes bad quality of bone. As patient no. 5 in this study shows, using a short stem is not a permanent solution, but it may be able to delay the implantation of a total femur, with all its disadvantages, for several years. This is important particularly for young patients with high levels of physical activity. Exceptional use of a short stem with a stump lengthening procedure is a very specialized indication. However, it is known that disarticulation of the hip joint and high-thigh amputation can lead to severe changes in function, mobility, and cosmetic appearance, and to considerable limitation of simple daily activities . The two surviving patients in this study were able to walk using an exoprosthesis. Even the two patients, who died, were able to wear an interims exoprosthesis. Although the indication is rare, the approach can be useful in specific cases. This study is limited by the small numbers of patients and short follow-up periods. Large numbers of patients in tumor surgery and homogeneous groups of patients with this type of tumor are rare [1, 2]. Despite the small number of patients, the study showed that the mechanism of implantation of this short stem works, and it provided a proof of principle for this anchor system. The Buxtehude short stem is a good solution that can avoid or delay proximal femur resection in patients with tumors extending into the proximal metaphyseal femur. Additional risks associated with proximal femur resection, such as dislocation, opening another oncological compartment, Trendelenburg limp, and chondrolysis can be avoided. RD participated in the design of the study, the literature search, the extraction of data and the methodological appraisal of the study. He performed the statistical analyses, led the interpretation of results, was writing and drafting the manuscripts. MPH, GG, SH, JH participated in the data collection. AS participated in the design of the study and the writing the manuscript. All authors read and approved the final manuscript.